Number 5 Type Collection: Friday Giveaway: Your Team's Best Power Trio? This last featured pickup from the 2011 National in Chicago is cool for a few reasons. 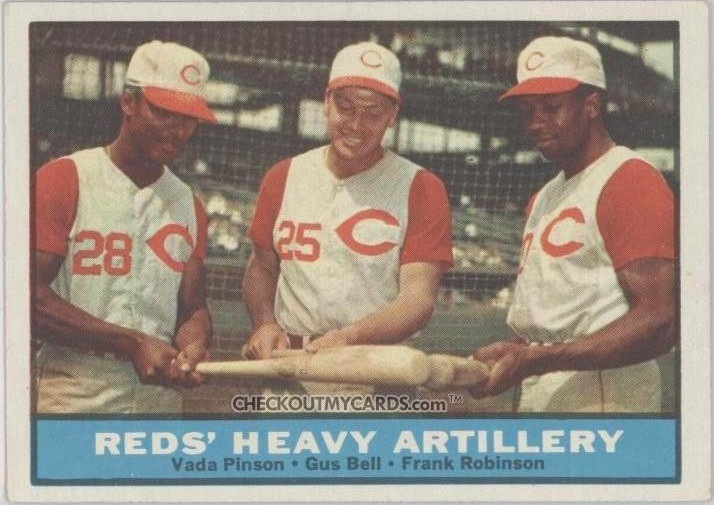 First, just 50 cents netted me Frank Robinson, Gus Bell, and Vada Pinson in a nice pre-game shot from 1960. Second, those sleeveless Reds uniforms always mean classic baseball; who can forget Ted Kluszewski in 1957? Third, Topps reused Gus Bell's own uniform number (25) for the card itself. Seeing these guys together--the top 3 in total bases for Cincinnati in 1960--made me wonder what the best 3-man slugging combos were for Seattle, my hometown team from ages 6 to 26. Who would I want anchoring their 2-3-4 or 3-4-5 lineup positions, year after year? This is how we all think about cards, right? That trio of teammates from 1996-1999 gets my vote as Seattle's best. Thus, the giveaway question! HOW TO ENTER: Who do you think is the best lineup trio for another franchise? Just add a comment with team, players, and basic rationale. 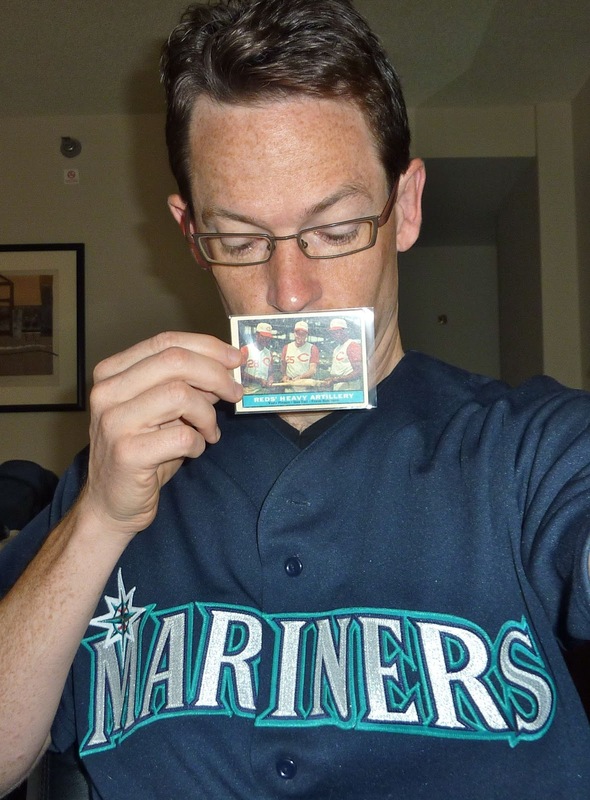 UPDATE: Vintage Sportscards is also running a National-based 1952 Topps giveaway! Entering both is like the Doublemint gum of vintage contests. As a Yanks fan this is tough...I'd probably have to go with Mantle, Maris and Skowron of 1961. Easy. Cubs. Williams (26), Santo (10), Banks (14). Their numbers fly from the foul poles at Wrigley. Two HOFers and one that should be. A lefty and two rightys. Thanks. Sorry, in terms of rationale - well, both those guys hit over 50 with Maris going for 61. Skowron hit 28, while Yogi had 22 and Blanchard had 21. I just went with Moose because he was #3. A's were always mixing things up... with Dave Henderson & Dave Parker back then, but this would be my favorite #2, #3, #4 combo. Scary thought... #1 during those years was always consistent: Rickey Henderson. I could go with the 'roid years and 2001 (Shawn Green - 49, Gary Sheffield -36, Paul Lo Duca -25). Or the mid '90s and Mike Piazza, Eric Karros and Raul Mondesi. Or 1977, when Cey, Garvey, Baker and Reggie Smith all hit at least 30 HRs. Gimme Frank, Boog and Brooks from the glorious times when I was proud to wear orange and black. Boog was Boog, just hitting bombs. I saw one of his longest, the 'Hedges Homer' in 1962 which was the first to clear that row of bushes in centerfield of Memorial Stadium. Brooks never hit a ton of homers but the ones he did hit seemed to come at very opportune times. And of course Frank hit them long, hit them often and hit them clutch. That's my vote and I'm sticking to it. Hey, this is interesting. I found a quiz that asks you to name the three members of the top HR trio for each MLB franchise. I have not tried it yet because I'd score terribly but someone should give it a shot. Much like Fuji I'm biased toward the home team, but 2004's trio of Pujols, Rolen, and Edmonds were pretty fearsome at the time. 34+ HR, 111+ RBI, .301+ BA, finished 3-4-5 in MVP voting. All in all they played together Mid-2002 through 2007. The 86 Mets had some sucess with these three. I figured Fuji would hit the Bash Brothers-era A's, but that's where I was going too. So "what he said." I'm going old school with the Brooklyn Dodgers of the 50's. Snider, Campy, and Hodges. I'll take the Philadelphia Athletics from 1928-1933 when you had Cochrane, Simmons and Foxx hitting 3-4-5. All three consistently put up OPS numbers at or above 1.000 and Foxx in particular had some of the best seasons in baseball history during that time. I would say Alou, Bagwell and Berkman from the early 00's Astros. Lots of pop and high averages from those three. The Phillies have had a few bashing people, but rarely a trio. The 2001 Rangers (steroid central) had Ruben Sierra with 23 homers, Raffy Palmeiro with 47 and ARod with 52. Rationale: Two are HOFers, and the third should be. I'm going to have to go with the Orioles trio dismissed earlier. Brady Anderson, Raffy and Bobby Bonilla. Brady was way more potent of a hitter with these 2 behind him. Additionally this was the last time my beloved O's actually came anywhere near a playoff game! For the Chicago Whales of the Federal League you had Art Wilson, Dutch Zwilling and anyone else. Wilson and Zwilling were the most formidable duo in the Federal League. If they had anyone else in the number 5 spot, they would have been the best team in the Federal League both seasons.